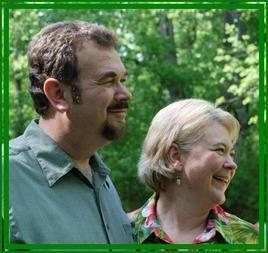 James and Leah King are ministers of inclusion embracing positive and practical principles of spirituality. They are interested in making a difference in the world by sharing uplifting teachings that embrace peaceful methods to assist people in reducing and healing their inner conflicts. James has said, "Now more than ever the world is in need of positive balance to offset fear and misunderstandings.If the world is a little brighter because of my having been here, then I will have fulfilled my purpose." James knew at an early age that he would become a minister. He had been involved with three non-denominational churches in Indiana and has been the minister at UCG since 2004. Under his leadership, the church acquired our 13.5 acres and built this new church home. Music, both writing it and playing it, is a passion for James. He is the author of the books "Dancing With The Universe, Lessons in Synchronicity" and "Jesus Never Said That: But What He Did Say Could Change The World." Leah, who is an ordained interfaith minister, stepped out of administrative church work and onto the platform to share in co-ministry with James almost 2 years ago and brings her own gifts and talents to the table. James and Leah have been married for almost 40 years, they have three grown sons (Matthew, Luke and Christopher) an awesome daughter-in-law (AnnMarie) and one delightful granddaughter (Izzy). James has served on the Board of Directors for the Greenville Interfaith Forum and as President of the Board of Directors for Unity Ministers of the Mid-Atlantic States (UMMAS). UMMAS hosts a retreat each year in September in the beautiful mountains of North Carolina. Visit their website for more information on the retreat. Leah currently serves as Vice-President on the UMMAS board. Both are available for weddings, spiritual counseling, christenings, and memorial services. Contact him through the church office at 864-292-6499 for an appointment.